This delightful villa is light and airy and benefits from a new modern white kitchen and enjoys stunning sea views across the Mar Menor. Conveniently located in the popular community of Los Molinos which is set in beautiful lush gardens and is only 50 metres from the lovely Los Molinos Pool and restaurant. La Manga Club is a premier leisure resort of Europe with a 5 star Hotel, 3 18 hole championship golf courses, 28 multi surface tennis courts, shops, bars, restaurants and spa facilities. One of the most enjoyable ways to make the most of the fantastic weather is to explore the resort itself and the beautiful local countryside, whether on mountain bike, foot, horseback. boat or car. The cities of Cartagena, Murcia and Lorca are all within easy reach of the resort. We are an active & social family who enjoy many different things. ie. the sports facilities on offer at La Manga Club as well as the breathtaking scenery in and around the Murcia region. We love the fantastic historic port of Cartagena, which also offers great shopping, restaurants, and places of general historic interest. Plus the convenience of the Los Molinos pool & restaurant as well as the social side is terrific - we have met so many lovely people at La Manga Club. We took a short 4 day break to La Manga Club in April 2010 which turned into 15 days, due to the volcanic ash disruption. We became well aquainted with La Manga, so much so, we bought our very own home in the sun. I thoroughly enjoyed updating the villa which included refurbishing the kitchen and generally making it homely and welcoming. I particularly love the upper deck and will never tire of the fabulous sea views of the Mar Menor and La Manga strip. I always look forward to visiting our home in the sun with my partner David and our now teenage son, Laurence, who loves the wonderful sports facilities on offer - personally I enjoy the convenience, peace and tranquility - totally relaxing! The villas benefits from 2 shower rooms, one of which is en-suite to the 2nd bedroom. The lounge is open plan to the dining area with 2 patio doors opening onto the lower sun terrace. Two sofas, TV with cable connection. Fully equipped with cooker, hob, fridge/freezer, microwave, dishwasher and washing machine. La Manga has always been synonymous with golf and with 3 18 hole championship courses and outstanding practice facilities, it has been voted Europes top golf resort three time is the past four years. The golf courses are located less than five minutes drive from the villa. Notes on accommodation: Wi-fi connection will be on for bookings in the high season (July & August) At other times this this can be arranged at an additional cost of £20 pw. Outside: There are two terraces - The upper deck is ideal for sun worshippers and the perfect area for early evening drinks and enjoy stunning views, whilst the lower deck offers a little respite at certain times of the day, a great area for breakfast and BBQ in the evening. You can enjoy a lazy lunch at the Los Molinos Restaurant followed relaxation by the pool which is located only 50 yards from the villa. Access to the pool area is private and can only be used by residents at Los Molinos - a key is provided to access this area. Cleaning / Towels / Linen / Maid service: The price includes air conditioning/heating, arrival and departure clean, linen and towels (please bring your own pool towels). If you are booking for 2 weeks. a mid stay clean & linen change can be arranged and the additonal cost would be £50.00. Other: The villa has a 2nd terrace area which is located via an outside staircase. The terrace area has uninterrupted stunning views across to the La Manga strip and Lion Head mountain. If you are a tennis enthusiast then La Manga Club could easily be defined as the ultimate tennis resort in Spain. Located at the very heart of the La Manga Club resort, the internationally renowned tennis centre is one of Europe's finest outdoor facilities and is the focal point for many of the resorts sporting activities. The wonderful climate and floodlit courts mean that you can enjoy a match all year round, day or night. La Manga Club Tennis Centre has played host on a number of occasions to such prestigious events as the Davis Cup and Fed Cup as well as numerous ATP Tournaments. There are 28 tennis courts to choose from, including 20 clay courts, four hard courts and four Astro Turf courts as well as two paddle tennis courts. La Manga Club has its own beach 'La Cala' located only 5 mins drive away. It boasts a fantastic fish restaurant. There are several other beaches - only 10 mins away is Calblanque beach, enjoyed for its wild & rugged character. Murcia (San Javier Airport - 25km/14miles, approximately 25 minutes by car. Alicante Airport - 120km/75 miles, approximately 1 hour by car. It is of course good to have a car however, you can book a taxi to collect you if that is what is preferred. Cartagena - 25km/16 miles. Murcia - 75km/47 miles. Alicante - 120km/75 miles. Granada - 340km/211 miles. Madrid - 470km/292 mile. Malaga - 470km/292 miles. Barcelona - 700km/435 miles. Bank & Cashpoint facilities are available on site. There is a small supermarket in Bellaluz Square (walking distance from the villa) and a large one just off the main road in the club. If you leave the club and head towards Cabo de Palos you will see a sign for the supermarket 'Upper' – this is just off the motorway and sells a big variety of food, clothes etc. 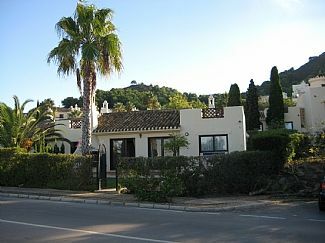 La Manga Club manages over 20 restaurants and bars both within the hotel and around the resort. There are also many privately owned restaurants and several bars offering a wide variety of dining experiences: Mediterranean, Indian, South-East Asian, Mexican and Italian speciality restaurants, a beachfront seafood restaurant (seasonal), an American diner, tapas bar, traditional pubs, Deli-Café and poolside snack bars (seasonal). For sports fans there are two club house bars on the golf courses as well as on course refreshment services and a welcoming snack bar at the tennis centre. The Piano Bar at the hotel offers nightly live entertainment. Children are made very welcome at the 30+ restaurants and bars within the resort, and of course in Spain generally. For those wanting to go a little further afield there are plenty of good restaurants within a short drive of the resort. La Manga Club is a wonderful resort with plenty of facilities for both the very active and those that enjoy a more relaxing holiday reading a book and lying around the pool. For younger members of the family you can book places on the golf, football, rugby, dance and tennis training academy during school holidays. La Manga Club also has a Mini Fiesta club which delivers activities and childcare for the under 12s (charges apply). Car hire is useful but not essential for your stay at La Manga Club - there is a supermarket, bar and a number of restaurants within a 2 minute walk. Ask for info on airport transfers or car hire with a local La Manga Club based company from either Murica or Alicante airports. Booking Notes: A 50% deposit is required to secure the booking of the property. The balance is then due 15 days prior to departure. Once the balance has been paid, directions to the villa will be provided along with key collection details. Changeover Day: Preferred changeover day is Saturday. Check in 3pm / check out 11am. Notes on prices: Prices are for the property per week, in pounds Sterling (£) and are inclusive of air-conditioning, linen, towels and cleaning of the property after your stay. If your booking is for longer than 10 days, a mid stay laundry change is included in the price. The property is managed by a local company who along with cleaning and maintenance provide an emergency call out service. Additional services such as cot hire, pre-stay shopping and airport transfers can be provided at additional cost.